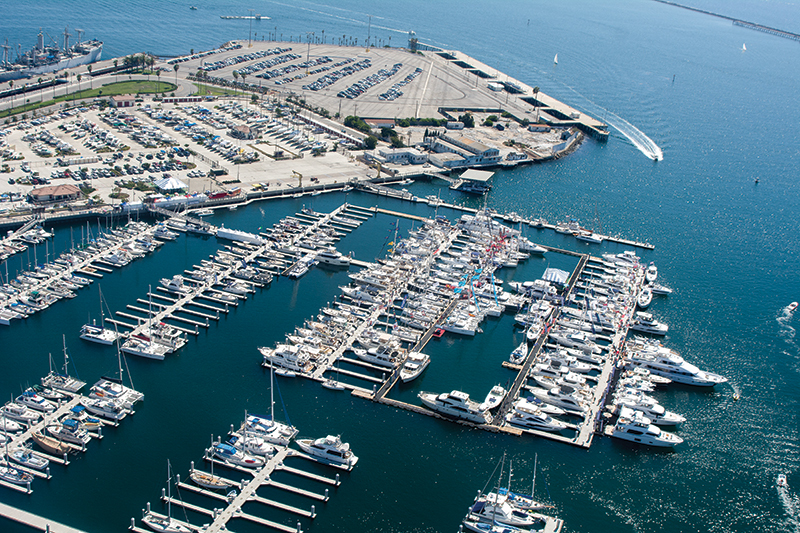 The Southern California Boat Show will fill Cabrillo Way Marina with 200 Boats in late September. The Southern California Boat Show might be new, marking just its second run from Sept. 28 – Oct. 1 at Cabrillo Way Marina in San Pedro, but its lineage goes back more than 40 years, to when its producer, the Duncan McIntosh Co., founded the Newport Boat Show and, a few years later, the Lido Boat Show. 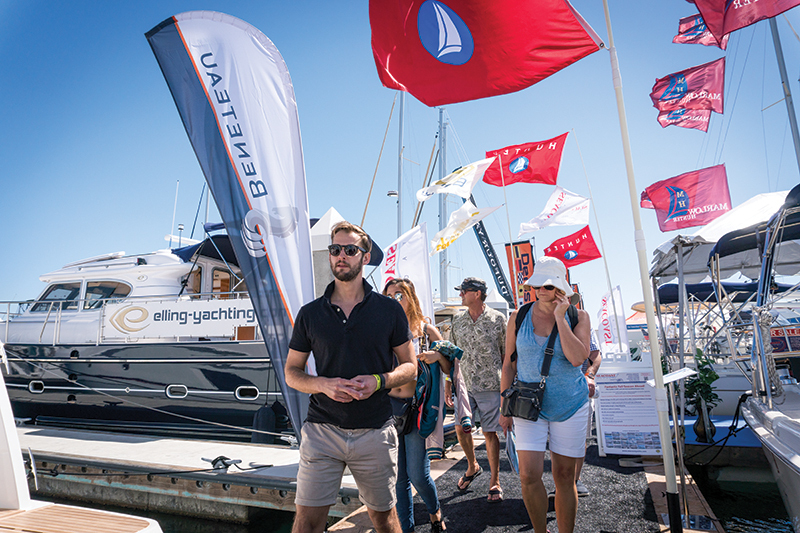 Having replaced Lido as California’s big fall boat show, the SoCal show will continue doing what Lido did for 37 years, namely give attendees the opportunity to see new and brokerage boats, big and small, power and sail, in their natural setting: the water. Cabrillo Way Marina is the show’s home, and it’s in a great location, next to SS Lane Victory, a decommissioned naval ship that now houses a museum; Ports O’ Call Village, which is home to shops and restaurants; and Battleship USS Iowa, another decommissioned naval ship that’s now a museum. And attendees who take the 710 freeway from the 405 freeway can drive across the iconic Vincent Thomas Bridge. 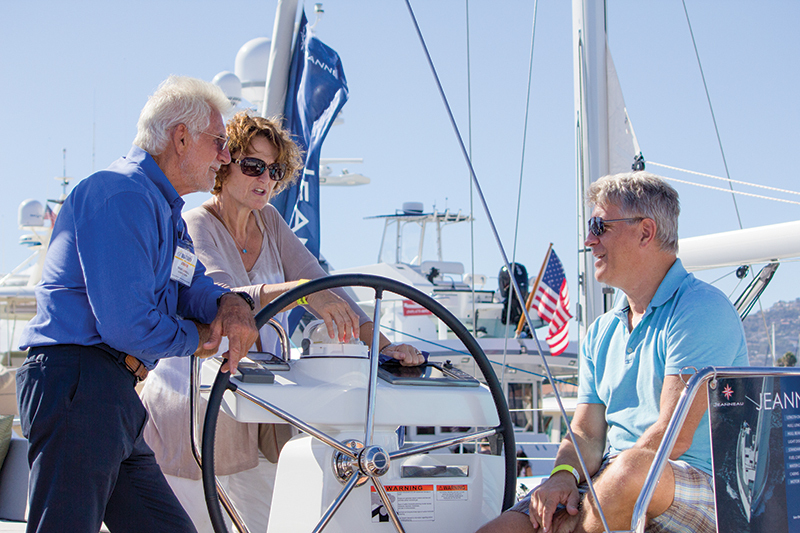 Blue skies, mild temperatures and light breezes might be what make the show comfortable for attendees, but the boats are the stars of the show — big, small; new, used; power, sail; fast, slow; coastal, ocean-crossing; harbor cruiser, island hopper; planing, semi-displacement, displacement; monohull, multihull; shaft drive, pod drive, jet drive; flybridge, sedan. We could go on. The smorgasbord is complete with the addition of all the booths for boating gear — beds, charts, engines, towing services, tenders, accessories and more. Attendees are going to see motoryachts, a pretty wide category of powerboat that includes fast and slow boats, pilothouse and flybridge boats, oceangoing and coastal cruisers, and many, many more. 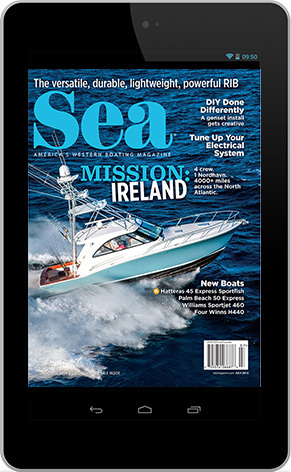 Several manufacturers you will see in this category are Ocean Alexander, Maritimo, Riviera, Offshore, Horizon, Hampton, Johnson, Carver, Princess, Cruisers, Marquis, Mikelson and more. What follows are other boat categories attendees are sure to encounter. 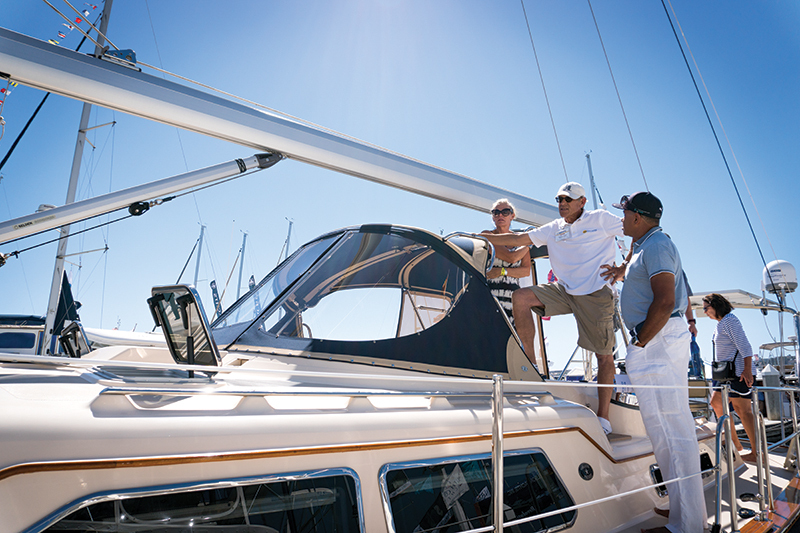 This style of boat has qualities from other styles, making it a bit of a Swiss army knife — large cockpit, single-level main deck, bow sun lounge, versatility and more. Express cruisers often have enclosed cabins, accommodations that include real staterooms and some even have flybridges, which is something that didn’t used to be the case. And don’t worry about the enclosed main cabin making things stuffy, because express cruiser designers have added large sunroofs to the hardtop, incorporated opening side windows whenever possible and created aft bulkheads that open most or all of the way. Cockpit seating is often covered by hardtop overhangs and extendable awnings. A few express cruiser manufacturers likely to be at the show include Beneteau, Cruisers, Hinckley, Maritimo, Prestige, Riviera, Sabre, Sea Ray and Tiara. Distinct in their styling, trawlers and tugs are easy to recognize, but their attributes aren’t as cut and dried as one might think. For the most part, trawlers are known to be slow and steady, able to reach places formerly reserved for the sailing crowd, and that’s still mostly true, though a couple of builders have used semi-displacement hulls and twin-engine installations to give the trawler some legs. 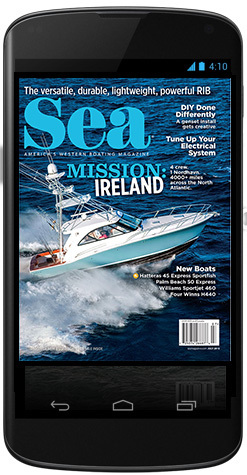 Sedan trawlers, and a few of the tug-style boats, have taken the pilothouse out of the equation, moving the helm to the main deck and creating a one-level cabin that stretches from helm to cockpit. Look for trawler and tug manufacturers such as Nordhavn, Selene, DeFever, Beneteau, Grand Banks, Kadey-Krogen and Ranger Tugs. A portion of the boating crowd boats by day and rarely stays overnight on the boat. Now, one can certainly dayboat on any vessel, but a boat purpose-built for that activity has its charms and appeal. The most recognizable dayboats are mostly open but with a hardtop or Bimini, have a large cockpit with lots of seating and have a certain “look” — maybe East Coast, maybe lobster boat. In a nod to versatility, many have a forward berth, a small galley and a head. Don’t let the term dayboat lull you into thinking this class of boat can’t get to Catalina. Manufacturers haven’t skimped on modern propulsion. Traditional-shaft boats have modern, efficient diesels, and pod drives and jet drives are used by many builders, to maximize performance and space. Some dayboat manufacturers that are likely to be represented at the show include Chris-Craft, MJM, Cutwater, Hinckley, Hunt, Sabre, Palm Beach and Tiara. Someone who hasn’t checked out the interior of a fishing yacht recently might be surprised. No longer utilitarian spaces built more for equipment storage and small berths for catnaps, fishing boat interiors are well finished, comfortable, family friendly and, in many cases, cruise ready. Some builders have so changed the face of their fishing vessels that they no longer consider them to be in the category. Many of the traditional fishing boat attributes are still visible — large cockpit, lots of rod holders, maybe a fighting chair (some of them modern thrones), possibly a tower with a small driving station — but the family/ cruising side is more prominent. 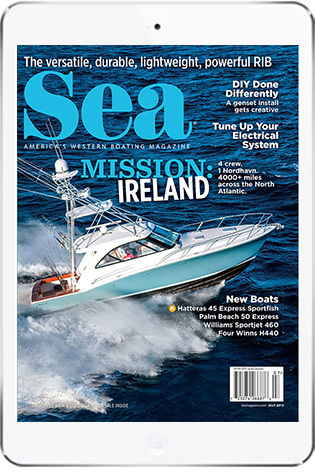 A few fishing boat manufacturers you will surely see represented at the show include Viking, Hatteras, Mikelson, Mag Bay, Cabo, and Bertram (though Cabo is no longer producing new boats and Bertram very recently got back into building after a hiatus). Two hulls, one boat. The powerboating world is now accepting the different-looking boats in larger numbers, thanks to sailboat manufacturers making the crossover and a few powerboat builders who saw the potential. They’re built for cruising, fishing, diving — for boating. Luxury yacht builder Horizon has two cats in its lineup, and Lagoon and Leopard — well known for sailboats — have power cat models. Cats come with wave-piercing hulls and planing hulls; with flybridges and without; with twin engines and with one; with outboards, inboards and sterndrives. Power: ArrowCat, Aspen, Lagoon. Sail: Fountaine Pajot, Leopard, Catana.